With a range of dignitaries in attendance, Simwave will officially open its 5,000-square- metre maritime training centre in Barendrecht on 19 April. The three hundred guests will take a look behind the scenes at the new location, which houses more than fifty simulators. The centre has already been in use for some time now. The ‘site acceptance test’ was successfully completed on 29 January in collaboration with the supplier of the simulators, the Norwegian company Kongsberg Digital. Since then, the entire ‘maritime centre of excellence’ has been operational and there are plenty of training courses being organised for and with customers such as Genting Hong Kong, Crystal River Cruises and Viking Cruises. 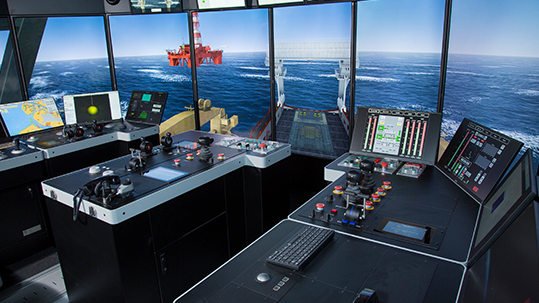 The courses can be run on one of the 59 simulators but a special feature is that they can also be linked to provide multi-vessel simulations. The showpieces are the ‘full mission’ simulators on which the entire bridge of a ship has been replicated almost at full scale, with 360-degree projection as support. The machine room with seven simulators, which occupies two floors of the building, is also impressive, as the guests will see live on 19 April.